The Cabinet of the Virgin Islands at a December 18, 2018, session has approved the allocation of approximately seven thousand, one hundred and six dollars ($7,106) per annum, for the provision of transportation services for former legislators Hon Ralph T. O’Neal, OBE and Ms Eileen L. Parsons, OBE. Hon O’Neal has been the co-father of the modern VI and was at the side of the late Chief Minister, H. Lavity Stoutt (D1). They both have been responsible for some 90% of all the development of the Territory that has led to the current prosperity and political stability the people enjoy today. Ms Parsons—who is an amputee—is the Territory’s cultural icon and has been at the forefront of many local landmark development such as Ellis Thomas Downs, the H. L. Stoutt Community College and many other sports such as softball and horse racing. Ms Parsons is also the founder of the Heritage Dancers. While there is no debate, as to having the two legislators benefit from state-sponsored transportation—since their sacrifices and commitment to county above self, remain extraordinary—a family member of a former legislator is asking how other former legislators can become eligible and what is the policy or criteria for such benefits. A call to government Spokeswomen, Ms Desiree Smith to explain the process, was unsuccessful. Our news centre was told she was “in a meeting” and could not take our call. 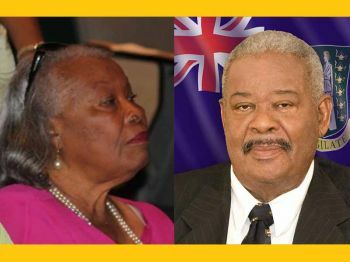 No doubt the former Premier R.T. O’Neal and former legislator Ms. E. Parson (Ms. P) have contributed immensely to the growth and development of the territory. Nonetheless, what policy authorizes and appropriates transportation funding for former legislators? Is the appropriation due to special needs? If you do it for two former legislators, do you have to do it for all former legislators, eg, Oliver Cills, Walters, Walwyn Brewley, Earl Fraser, Irene Penn-O’Neal, Vernon Malone, Keith Flax, Dr. Vincent Scatliffe, Elmore Stoutt, Alvin Christopher.......etc. Is transportation funding for former legislators a de facto or de jure benefit? Are former civil servants entitle to the same benefit? If it should be a means tested benefit for former legislators, put it in policy. I’m not averse to either the former Premier or Ms. P receiving the benefit; I’m just asking the questions. We all know it is really for Eileen Parsons. They just added Ralph name to make it appear impartial. Ralph don't need their handouts. Is this the same NDP government that stopped Fahie's programme for providing transportation for elderly persons to the clinics. Why can't this be a civic duty? Should be a privilege to drive such luminaries and to have a chance to learn something from them. That said, these folks no doubt have benefitted financially from their positions, and are getting full salaries win their pensions. That should be able to cover the expenses, or is it they don't agree with the kinds of rates taxi men want? All life is valuable- but there’s no denying the sacrifices individuals make when they take on political calling- they dedicate endlessly and their personal life and their own families involuntarily let the community borrow them and the families grapple with the choice the politician makes to willingly serve- WILLINGNESS is what is necessary to serve for one term and the next and so forth and so the argument should be that when they can’t serve anymore that we should in turn return the favor and willingly reciprocate service; and protect and provide even if conditions and provisions are fairly implemented- remember that we are asking means it may get worst than this- but it doesn’t have to if we acknowledge an once of prevention is better than cure - let’s have humanity as a misssion to make VIGA (make VI great again) and let’s continue to show these honorable persons appreciation and make a decision to do whatever it takes to make the quality of their senior years comfortable- BVI is better because you may have gotten the better deal than their own children and families- YES BVI take care of your living treasures!